Venture Ski is proud to offer the finest family ski accommodation in Sainte Foy. 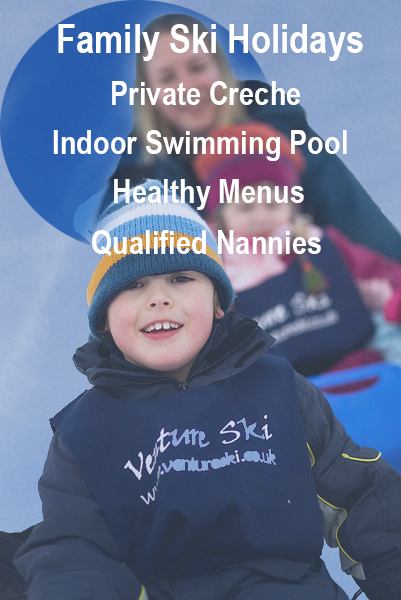 Childcare and crèche services are available in or next to your chalet. Join us this winter for a holiday the children will remember. We are parents also, so we know what it takes to make a family holiday successful. Our chalets are beautiful and comfortable – and our rooms are appointed with children in mind. Our children’s menus are freshly prepared and created using only the best local ingredients. We work hard to feed our young guests properly, so they have energy to take on their mountain activities. Our childcare providers are comprised of qualified nannies and early years teachers. 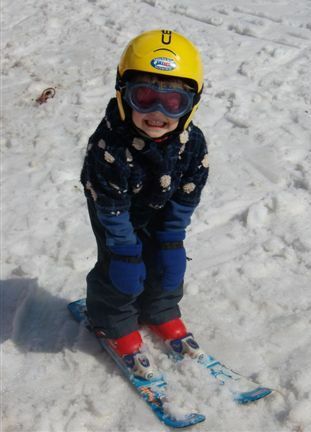 They know how to engage with your children, helping them discover their winter surroundings and socialise with new Venture Ski friends. And our creche is warm and bright. The facility is very well appointed with books, arts and crafts, toys and space to create and have fun. And our indoor swimming pool and spa is a big hit with the children. The spa is warmed with underfloor heating and the pool temperature is kept at a very comfortable level. The hot tub is available for you and your older children to enjoy at the end of an energetic day. Sainte Foy is famous for uncrowded pistes. The sight of a lift queue makes the headlines! There are gentle learner pistes and great ski schools, making it ideal for beginners or children. The Tourist Office makes special efforts to give children a magical experience, with hidden treasure hunts, prizes and certificates for spotting local wildlife or hidden tokens. The pistes all culminate at the resort – so you can’t get lost or lose your young ones. And although skiing the advanced runs, you are likely to spot your friends and family as you transit around. The Venture Ski Indoor Pool and sledging hill provide entertainment beyond the piste. Perfect for tiring out the children so you can enjoy some well-deserved relaxation time. The Venture Ski Directors are no stranger to Family Ski Holidays. 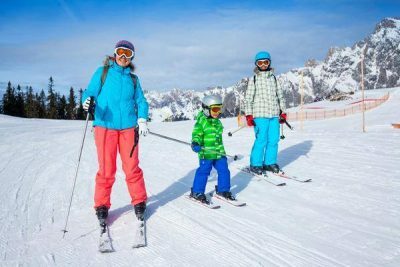 Having raised and taught all of their children to ski within the resort of Sainte Foy, they know what makes an excellent Family Ski Holiday for all. Ouracclaimed childcare service has been reviewed and recommended regularly in the national press. 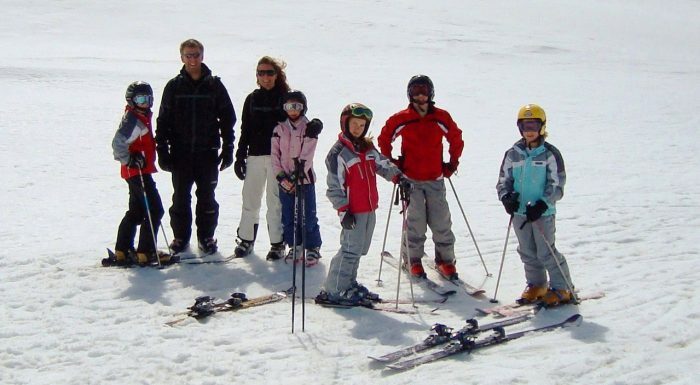 We are the industry leaders in delivering family ski holidays and private creche facilities in the Alps. Our crèche is a warm and bright facility with underfloor heating, plenty of toys, activities and crafts and windows with views of the Isere valley. The children have their own toilet area and the nannies have their kitchen to prepare the children’s lunches therefore ensuring the children always have access to fresh food, drinks and dining areas. To keep up their energy, children require plenty of nutritious snacks and a decent well-balanced lunch. Our team freshly prepares the children’s food each day in the crèche kitchen, ensuring that nutritional and hydration needs are met. As a result, you can relax while out on the mountain, knowing that your child is receiving high quality food and care. 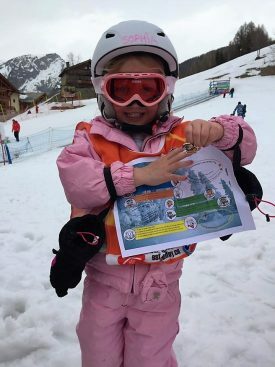 A most noteworthy part of our childcare service is the pick up and drop off of your child(ren) at ski school. Our team and their helpers organise the safe movement of the children meaning you don’t have to miss your own time on the mountain. While in the crèche, your child will have their daily activities recorded for your review at the end of the day. The child care team will take you through the information and explain the activities and meals that the children enjoyed throughout the day. Please find details of the Creche and Childcare Services on offer on our Childcare page.